The “getting to know” series continues this month with Jamie Ward in the hot seat. I first met Jamie at the inaugural New English Workshop summer school – while Chris Schwarz cracked the whip and 18 of us slaved away at building Anarchist’s Tool Chests, the seemingly unflappable Jamie was on hand to run the workshop and offer constant advice and encouragement. Although you are now course leader at Warwickshire College, you have previously worked as a professional furniture maker, right? Tell me about your career before you moved into education, including where you trained? I trained at Warwickshire College in the late eighties which is interesting as I have gone full circle and returned to the workshop where I first started and now teach from. So when I am trying to motivate one of our 16 yr old students who is having a ‘bad day’, I try to think back to when I was on the course and their age. So I went from that course into the construction industry, mass producing joinery (windows, doors, stairs etc) for large house builders like Barrats, Redrow, David Wilson Homes. We had daily targets to run 3500 metres of components through the machines, it was a touch soul destroying and monotonous. I was made a supervisor by the time I was 20. Once I had learnt how to use the various wood machines, including four cutters and double ended tenoners it was time for me to move on. So after 9 years in my first job, I decided I needed to change things to progess and so I decided to sell my house, give my job up and go to university – I was 26. I felt I could use my woodworking skills gained from my joinery days and refine these and go into furniture making. I did my research and felt that Buckinghamshire College in High Wycombe (the home of furniture making), was the college for me. At that time it had the largest furniture making education department in the country and lots of industry still located around the town. Unfortunately Bucks New University as its known now, is about to close most or all of its furniture making courses – very sad. So I embarked on 5 years at uni, first on a HND Design (Furniture) course then progressed on to BA Hons Furniture Design & Craftsmanship degree course and I loved it. It was so satisfying breaking away from the rigid routine from working in a factory to being able to design furniture and then make it. The experience gained before uni was invaluable in gaining work whilst at unI and my first college job was working holidays in an amazing furniture workshop ran by Richard Williams. This experience taught me lots, including accuracy, attention to detail and how different it was to work in a small bespoke furniture workshop compared to a large joinery workshop; complete chalk and cheese. In fact as I write this I have just returned from a surprise party at Richard Williams to celebrate his 25 years in business. It was great to see Richard and many people who have played apart in his business and that includes his university tutors from who were also my tutors, this just confirms how supportive the industry is and how tight knit it is and everyone knows everyone. My time at Bucks College was great, I met my wife there and it gave me a first class degree, something I never thought possible when I was at school. A lesson to my 16 yr olds students – ‘you can change things and make things happen even after a bad time through school’! After university I help set up a furniture workshop in the Cotswolds in a beautiful village but making furniture for clients in London, it allowed me to use the skills from both university and my joinery days to build a successful workshop and business. After a couple of years I started teaching an evening class at Warwickshire College which 13 years later, I still teach. Within two years of starting teaching part time I then went full time at college. Teaching is amazing, I love passing on my skills and showing passion for furniture making and seeing students leave and gain jobs in the industry or go onto university just as I did. I still keep my hand in and design and make furniture in my spare time, but teaching takes priority. What prompted the move into education? I never set out to go into teaching, it began with an inquisitive question to the course leader of the furniture course at the time, do you have any part time teaching posts available? and before I knew it I was teaching an evening class. I caught the teaching bug here. I was teaching mainly mature students just 1 evening a week, they made a couple of set projects like tables and wall cabinets then they moved on to their own projects. We continue to have projects that range from bird boxes to the largest project to date, a flight of stairs. Running the furniture programe at Warwickshire College puts you at the forefront of training the next generation of makers. What from your perspective are the main challenges for keeping the woodwork crafts alive? FUNDING! I have helped implement a forum with fellow furniture course managers from around England and we often discuss the challenges of proposed funding cuts and how we can overcome these. Because the furniture industry is quite an unknown industry, its not the first career choice of many. 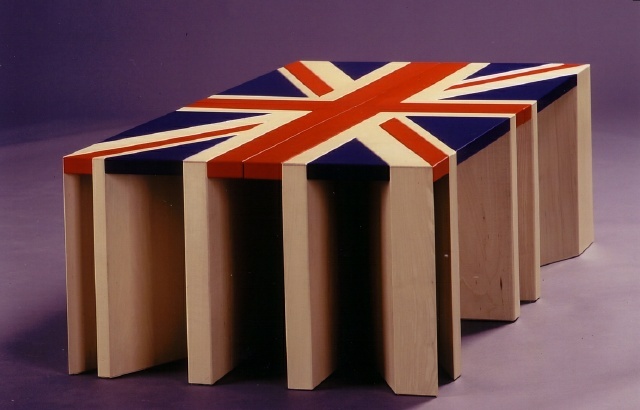 Did you know the UK Furniture Industry is bigger than the Aerospace industry in its turnover? I have recently become a freeman of The Furniture Maker’s Company. Only last week there was a conference called ‘Mind the Gap’ at The Furniture Makers Company and it discussed the challenges of training and engaging with education and industry, there was also a recent survey carried out – please do click on this link to find out more. 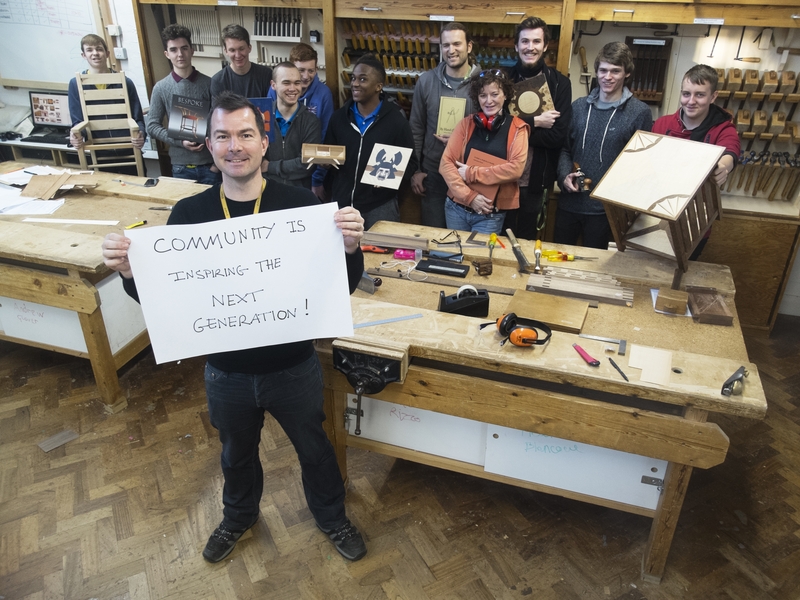 Next is getting the opportunity to discuss furniture making to 13-15 year olds and therefore RECRUITING FROM SCHOOLS. Because we are a Further Education College with various courses ranging from A-Levels to plumbing to engineering and furniture making, I feel some schools see us as competition. Therefore it can be challenging to gain access to this age group and promote furniture making as a career. There are some local schools that welcome the college in and offer careers events, it would be good if this was more widely practised. Staying in school to do A-levels is not for everyone! And now children have to stay in education until they are 18. Even before secondary schools, it could be said children are making less, how many of you played with Lego bricks or made Airfix models? I did and I loved making things. So are enough children being exposed or getting the opportunity to put the Ipad down and be creative? Last is PROGRESSION, we have some industry on our doorstep, and we work hard to keep and maintain contact with these companies. It is important to have routes into jobs and for some, onto higher education courses. Around 70% of our students progress into a job or on to a university on completion of their studies. These jobs include, furniture making, wood machining, boat building, kitchen making, theatre set making and joinery to name just a few. The jobs are there but we don’t always hear from employers, it is common for companies to want employees with experience, but its that old chestnut, ‘how do you get experience if no-one will give you a job?’? 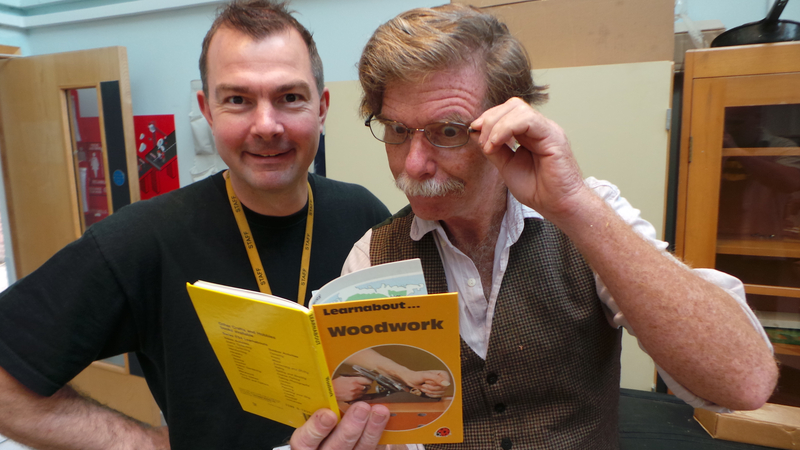 So, challenges aside, what are the positive elements of teaching woodwork? What do you find most rewarding? I love teaching, I do not struggle to get out of bed and come to work each day. Every day is different and always rewarding to see skills being past over to the next generation – ‘Inspiring the next generation!’ sound familiar? 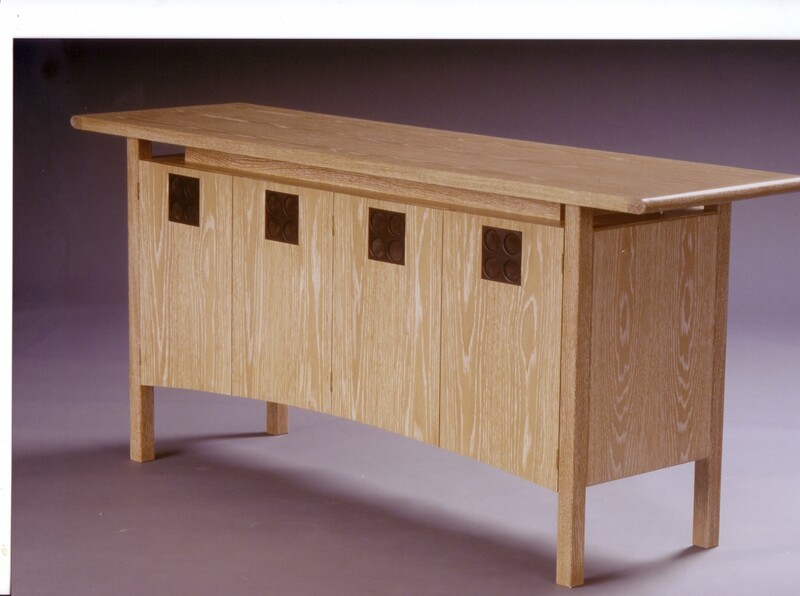 As a tutor we are rewarded in many ways, whether that is seeing a student master cutting dovetails or stand back and look at their finished piece of furniture and a broad smile appear when they have concluded the production journey and the birth of a piece of furniture. The realisation that this can be such a self fulfilling activity. We have an end of year show and this an excellent platform to witness the joy of furniture making and end results where students show their work to family, friends and possible employers. It is very rewarding to observe and watch the smiles of the students, the faces of proud parents the feeling of my job has been completed for this stage in their careers and now its over to them to see where they can go in the industry. So reward comes in various amounts, daily, weekly or in one big dose at the end of the year. You obviously have to teach a broad range of skills, but how would you classify your own approach to woodwork? Are you a handtool purist, a machine focused worker, or do you have a hybrid approach? What lead you to your method of working? Well, with a varied woodworking background, my approached has evolved. As mentioned, I began mass producing joinery, there was no time to spend using my trusted Stanley no 5 there! University and working for Richard Williams showed me how there could be a mix between machines, power tools and hand tools and still make beautiful crafted furniture and there be a successful business. So my approach to teaching is that of a pragmatic, or as you put it, a hybrid approach to woodworking, If you are going into industry I feel it is my duty to show a range of ways to work. This could be by hand with very little machines or with the use of a broad range of machines and accompanied hand skills, for example hand cut dovetails when making drawers. This is my approach to furniture making, use the kit around me and use hand skills when required. Preparation of materials like sawing and planing, well I do like our machine shop full of Wadkin and Robinson machines – so I’m happy to use them! ‘Time is money’ is a mantra that I have learned, and with two young children, ‘time is precious’! 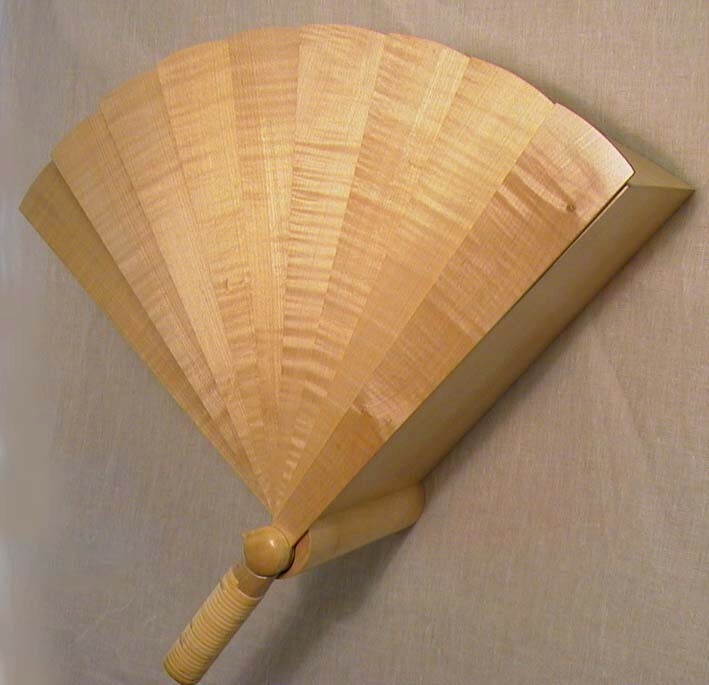 With your own woodwork, what styles or types of work do you consider to be influences? Influences I feel are varied for me, the obvious ones would be Richard Williams who gave me my first fine furniture making opportunity. 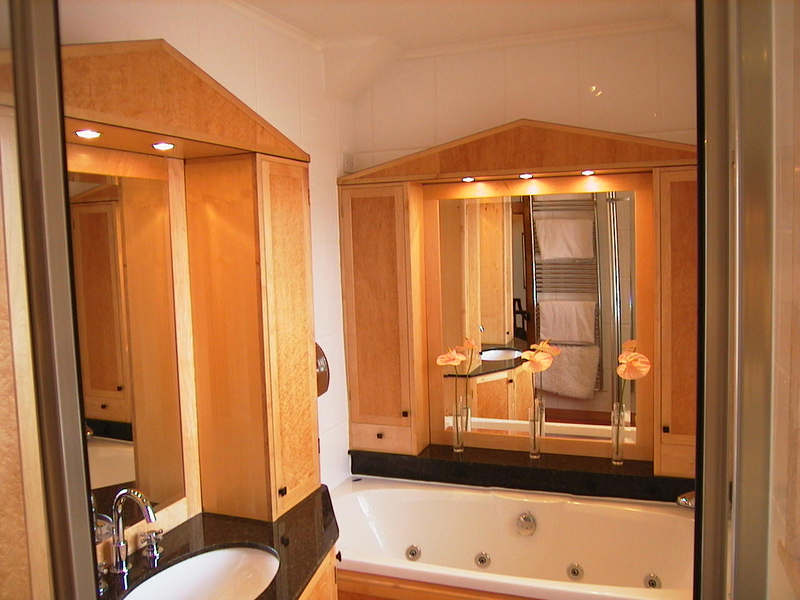 Elegant and well made furniture with the use of quality materials. Charles Rennie Mackintosh and his use of sculptural or dominant designs to set a feel for a room, for instance the ladder back chair in the hill house. Paul Smith with his use of colour and stripes; love the understated exterior of his suits and then a flash of colour with the linings. Then I have to mention the arts and crafts movement with Gimson and The Barnsley’s. I’ve really enjoying visiting Arts and Crafts houses this year and seeing the furniture with through tenons or solid oak panels. True and honest furniture, build to last but also functional. Let me finish with a William Morris quote, ‘Have nothing in your house that you do not know to be useful, or believe to be beautiful’. This entry was posted in Anarchist's Tool Chest, Furniture Making, getting to know and tagged community is by overthewireless. Bookmark the permalink. Great interview, and high time someone put JW in the spotlight. Jamie is one of the most inspiring people I know. His calm enthusiasm for the craft and passion for the process of sharing knowledge and skills has a catalytic influence on the young (and not so young) makers who study with him. We are truly blessed to have such a ‘maker of makers’ in our midst.